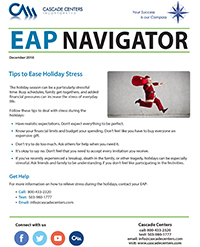 The holiday season can be a particularly stressful time. Busy schedules, family get-togethers, and added financial pressures can increase the stress of everyday life. - Have realistic expectations. Don’t expect everything to be perfect. - Know your financial limits and budget your spending. Don’t feel like you have to buy everyone an expensive gift. - Don’t try to do too much. Ask others for help when you need it. - It’s okay to say no. Don’t feel that you need to accept every invitation you receive. - If you’ve recently experienced a breakup, death in the family, or other tragedy, holidays can be especially stressful. Ask friends and family to be understanding if you don’t feel like participating in the festivities.